Some of my fondest memories of playing D&D back in the ‘90s don’t come from the games themselves. Instead, they come from the hours I spent digging through the massive boxed sets that TSR used to produce – worlds and cities and epic adventures laid out in minute detail, with exquisite poster-sized maps and tons of images, maps and notes to be handed to players. I remember pulling out the boringly titled Player Handout 11 from Dragon Mountain and just loving the depth something like this can bring to the game. The Dragon Mountain adventure books never fully explain what this handout is. It’s found in a slave den inside the Kobold-infested mountain, with no explanation of how it got there or what area it’s referring to. I remember wanting to know who drew the map, who annotated it, why they were in the mountain, whether they ever got out alive. What are the “pests”? And, when I actually got the adventure to the table, I got to witness my players go through the same questions themselves. The world suddenly felt alive, bigger than just the area inhabited by the PCs, and that was a great thing. As a writer, I’ve often heard the advice to “show, don’t tell”. On the surface, it seems like player handouts are the perfect time to put that advice to use. Why tell the players what a letter or journal entry says when you could hand them a copy of it and let them read it for themselves? Over the years, I’ve made plenty of handouts for my players, very much inspired by the things I found in those old TSR box sets. Sometimes I was lucky, and they did exactly what I wanted them to do – enhance the story, and the world, and maybe provide a clue to a good next move for the players. Unfortunately, though, that is not always the case. I’ve already talked a little bit about my current campaign. The party tracked a bandit back to a ruined fort in the forest, where they expected to find the bandit leader (who had already fled due to general dicking-around by the party and a standard Leroy Jenkins moment from Captain Manbearpig). Once they reached the top of the tower they found a map marked with the location where they had been ambushed and the name of the merchant they had been travelling with, along with two other locations and very brief notes on who was to be robbed and when. I thought it would provide a good hook to pull the party on a cross-country chase. Yes, that’s drawn on a newspaper from 1886. No, I don’t care this it’s not actually very good. It did, but not without a little gentle handholding from me. The party pored over the map, trying to pick up clues from it but never noticing the notes written at the top of the page. This is the downfall of handouts that are designed to progress the plot. If the party find a letter and you simply tell them that it contains a reference to a person, or a location, or whatever, the players immediately suspect that this is important – because you’ve taken the time to mention it. (Some people would argue that this is meta-game thinking and shouldn’t be encouraged. They’re mostly right, but sometimes it simply helps keep the game running smoothly. In addition, you’re always free to throw in a few red herrings to prevent them from immediately latching on to every word that comes out of your mouth.) If, on the other hand, you give them a handout that contains that same information hidden in amongst lots of fluff, though, and it’s just as likely that they’ll fixate on some tiny detail you added in a pique of creativity. Sometimes that’s great – I’ll be writing about how you can use this to add real depth to your games in a future post – but sometimes it’s the opposite of what you and the players want. In the case of my poorly annotated map, the players were stumped. They wanted to pursue the bandits, and I thought I’d given them the means to do that, but with two seemingly random marks on the map they didn’t know where to go next. That was nobody’s fault but mine. So, how do you deal with a situation like this? I didn’t want to step in as the DM and point out what they had missed, because the party were fully immersed in discussing this map in character. I didn’t want to ruin that. Instead I asked Adam/Tharin – the cleric, who was holding both the map and the highest Wisdom score at the table – to make a Perception check. Mentally I set the DC at 10, because although I needed him to notice this text I still wanted there to be a chance of failure (after all, the plays had essentially failed their own Perception rolls to spot this same thing). Still, with a +5 to Perception, I knew Tharin had a pretty good chance of making such a low DC. The roll was a success. 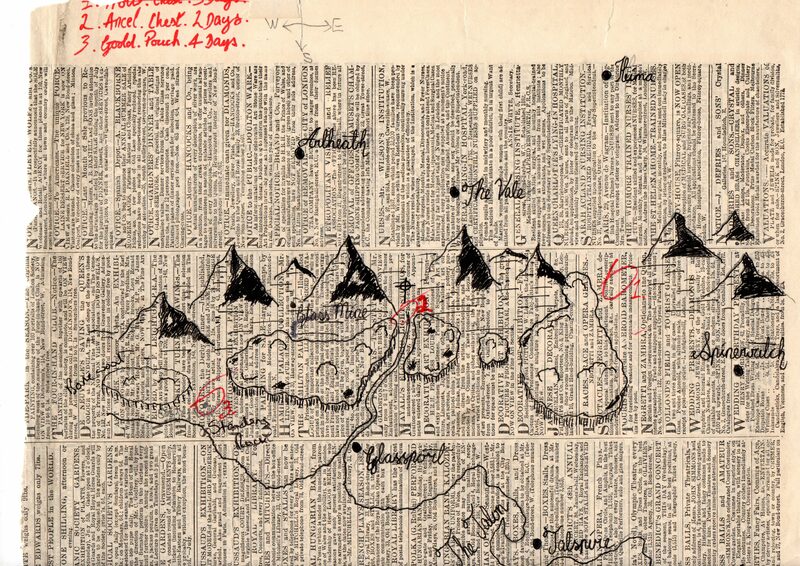 As the player’s examined the map I told Tharin that he suddenly noticed the writing at the top of the page – and, lo and behold, Adam suddenly noticed the writing at the top of the page. Everybody laughed that they had missed it, and the game got back underway. I’ve had similar things happen over the years, and there’s not really any way to judge whether a handout will do what you want it to do until it’s on the table, at which point it’s a little too late to do anything about it if it causes problems. What I’ve found – and the way I intend to plan my games in future – is that the best handouts are those which help develop the world and the characters within it without really impacting on the immediate plot. The real magic of D&D – the thing that separates tabletop gaming from video games – is in seeing a world and its people come to life and respond to the things that the players do. To take yet another example from my current game, Captain Manbearpig recently encountered a gnomish merchant who seemed to know about things that nobody but the Captain should know about. He also knew about the ManBearPig that the Captain both hunts and wears the pelt of (I know, I know – my group are truly ridiculous), and after much discussion he and the merchant arranged for some custom-designed arrows to be made to help bring down the ManBearPig, should the Captain ever encounter another one. What Ash doesn’t know yet – and I’m hoping he won’t read this article and ruin the surprise – is that when he returns to town he’s going to find it plastered with tacky adverts for these new arrows. (Impress Your Friends! Mutilate Your Enemies! Slay the Fabled Mantiboar! You get the idea). And the real fun of it is that I’m not going to describe these posters to him. I’m going to hand one to him. I don’t know how Manbearpig will react, but I can’t wait to find out. And unlike hiding a clue in a journal entry, there’s nothing riding on this. It’s a little bit of fun, and if it goes well the world will feel that much more real. And if Manbearpig brushes it aside and forgets about it? That’s fine. It won’t affect the game in any way. As always, if there’s anything you think I’ve missed or anything you disagree with, if you have any fun stories or cool handouts you want to share, and if there’s anything you’d like to see covered in future posts, let me know in the comments. This was originally posted to Critters RPG. Even if you’ve been playing D&D for years, preparing to run a campaign – or even just a one-off session – can be a daunting task. And if you’ve never run a game before – or if you and your group are all completely new to role-playing games – it can be downright terrifying. It’s true that DMing is a lot of work, but you shouldn’t let that put you off. DMing is, in my opinion, the most fun and rewarding way to experience playing D&D. Today we’ll take a peek behind the screen and look at some of the things I do to help make that all-important first session go smoothly. They may not all work for you, and that’s fine; and if there’s anything you think I’ve missed, please let me know in the comments! Before you start thinking about what you want to happen in the game, it’s important to decide exactly what shape your first session is going to take. If the players are all seasoned pros, that’s easy; they’ll probably come to the table with characters pre-made, and you can launch straight into the game. Sometimes, though, that won’t be the case. Let’s assume that you’re all new to the game. In that case, you’re going to need to create characters before you can do anything. As I’ve talked about in my last couple of posts, character creation is something that you’ll want to do together as a group the first time you play. The ideal length of time for a D&D session varies from group to group, but I find that somewhere in the region of 3-4 hours – with a break in the middle – works well in most situations. For your first session, I’d say expect to spend the first couple of hours on making characters. Players are going to have questions, they’re going to be unsure what kind of character they want to play, and they’re going to spend an inordinate amount of time poring over lists of spells that they have no chance of being able to cast at 1st level. This part of the night is not something you want to rush; this will be people’s first experience of the game. Savor it and enjoy it; these characters are new and pure. They will never look like this again. The second half of the night (or day, or evening, or whatever) is game time. And because you’ve already planned ahead and know that this session is going to be shorter than future games, you can build the adventure with that time constraint in mind. For new players, I think it’s important to do two things quickly; the first is to get them comfortable role-playing their characters as soon as possible (although some groups prefer to describe their actions rather than role-play them – and that’s fine). The second is to teach the rules. The old cliché of D&D is that all campaigns start in taverns. It’s tried and true; you as the DM can easily step into the role of an overly-friendly landlord or barkeep who takes a distinct interest in the group and why they’re in town, and has some rumors to spread that point the way towards the group’s first real adventure. And if all else fails, it’s easy to have somebody burst into the tavern in need of help, or with nefarious goals in mind. And in their banter with you as the innkeeper, you’ve got them role-playing. That leads me to the second thing part; get the players into combat as quickly as possible. Until they’re actually rolling dice, players might not really get what their characters can do. A couple of sheets of paper with abilities and numbers written on it does not a character make; it’s how that character acts when their life is on the line that makes the stories you’ll remember for years to come. You don’t need to go through all the rules with your players in advance; the best way to learn is to do, so send someone into that room with a knife and let your players start chucking d20s at them. Of course, you don’t have to limit yourself to taverns. My most recent campaign began with the party travelling with a merchant caravan (another cliché, but one that also works). It wasn’t long before the party found that the bridge had been collapsed and bandits were abseiling down the cliff above them intent on stealing a very specific object from the caravan. The characters had a task – protect the caravan – and an instant threat to the success task, along with an immediate goal in recovering the stolen artifact that fueled the rest of this session and the next one. One thing to bear in mind; no matter how much preparation you do, the game only exists with the cooperation of your players. You can do all the planning in the world, but if your players want to go off and explore you should let them. The best stories are the ones the players tell themselves, without any prompting from you – and it’s easy for you to change things around behind the scenes so that you still get to do the cool stuff you want to do. Maybe you’ve spent days mapping out and populating a dungeon in the sewers, but the party decide to hike out and investigate the ruined keep on the horizon that you mentioned in passing. Let them. Once they’re there they could find that the surface level of the keep in abandoned, but a dark passage leads below the earth, and horrors lie beneath… Throw in your sewer dungeon, and you’re good to go. The first session is really about introducing the game, setting up the beginnings of a story that your players can get excited about, and managing their expectations for the game going forward. Bear in mind when you’re prepping for the game that you will probably never have as much time to plan for a session as you will for the first one. If you run a game with a few combats and you have beautifully illustrated battle maps for every single one of them, and stunning handouts showing characters and items that the party encounters, you might find that your players are a little disappointed when week two doesn’t have quite the same production values. If you know you’ll have the time to produce these things then absolutely go for it! I’d only suggest trying to keep things consistent week to week. Nothing can kill your enthusiasm and enjoyment as a DM more than seeing disappointment on your players’ faces – and though you want them to have fun, you need to make sure that you are enjoying the game too. DMing shouldn’t begin to feel like work. If you’re as excited to play as your players are, then you’re doing it right. Especially after the first game, you want your players to go home excited to come back and play again. Maybe the group levels up after the first session, and everybody wants to carry on playing so they can see what their new abilities and spells do. Or maybe they returned to the tavern only to find that goblins have tunneled up through the cellar and left everybody dead – and they’ll have to wait for next week to get revenge. Be as cheesy as you like. Cheese and cliché exist because they’re effective. Don’t be afraid of them. You’ll find while you’re playing that you forget how some rules work, or that you aren’t sure how to handle some situations. That’s fine, and it’s part of the game. I’ve found that the best thing to do if you can’t find the real rule quickly is to just make a ruling for the time being, promise to look it up later for future reference, and move on. Don’t sweat it, and don’t dwell on it. You’re all learning the game, and nobody is expected to be an expert immediately. I’ve been playing D&D since the early ‘90s, and in my first 5e session I still had to look things up and wing a few decisions just to keep the game moving. It’s more important that everybody has fun than that the rules are followed strictly, and I promise that if everybody has fun nobody will care that you couldn’t remember how grapple works. That said, the best aid for this kind of thing is the official 5th Edition Dungeon Master’s Screen. As well as containing quick tables for a lot of the more commonly-used rules, it also gives you quick and dirty guides to setting DCs and a table for generating random NPC names for that moment when the enormous fighter decides to stop and chat to a passing gnome in the street and you don’t have anything prepared. Next time we’ll be looking at some ways you can allow your players to build your campaign world for you. Leave a comment if you liked this article, and if there’s anything you’d like to see covered in future posts let us know!